With one of my kids in school now, and my youngest wanting to be constantly with mommy, I have been struggling during the week to get quality meals on the table. One meal that my whole family can agree on is pasta. It doesn't matter how I prepare the pasta, my two boys will devour it. Since I make pasta about once a week, I try to vary up the recipes I use as frequently as possible. During the summer months I especially like incorporating fresh vegetables and was pleased when a recent issue of Martha Stewart Living had a recipe for Pennoni with Grilled Eggplant, Mint, and Burrata. This recipe has 9 ingredients and takes approximately 30 minutes according to the recipe. There were a number of modifications that I had to make based on the availability of ingredients at my local stores. First, I substituted rigatoni for pennoni. The types of pasta available in my area are limited, so I bought what was available. I keep telling myself that I am going to pull out my pasta maker and start preparing more fresh pasta and so far I haven't been successful. I make just about everything else, so my next food adventure in the coming months is to actually start making pasta from scratch. Secondly, I substituted mozzarella for burrata, and left out the red Thai chili, since once again I was working with what was readily available locally. Finally, I changed the grilling method for the eggplant. I roasted the eggplant on my indoor grill, with the lid open. Since my eggplant was grilled indoors, I had to grill in batches which increased my cooking time by about 45 minutes. I followed the remainder of the recipe as written. There was something off about the proportion of pasta to eggplant in this recipe. The taste of the eggplant was delicious, but there was just too much of it. I think the recipe would have benefited from the eggplant being reduced to 2 total, 5 was just too much. 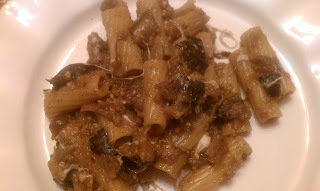 The taste of the pasta was delicious, but overpowered by the mass amount of eggplant. If I try this recipe again in the future I will reduce the number of eggplant, cut into pieces, drizzle with olive oil and oven roast. I think these recipe modifications would lead to a more balanced dish, with the same great flavor. For the recipe go to Martha Stewart Living Pennoni with Grilled Eggplant, Mint, and Burrata.